Entertainment Media Council, the association for business leaders in the video game industry, today announced that the leading history of the online game industry, Online Game Pioneers at Work. The book is now available in print at Amazon.com, Barnes & Noble, and bookstores around the world and the ebook will soon follow. In Online Game Pioneers at Work, bestselling author and celebrity interviewer Morgan Ramsay speaks with 16 creative and business leaders in the online game industry, such as astronaut and Ultima creator Richard Garriott, Supercell CEO Ilkka Paananen, and Kongregate CEO Emily Greer. 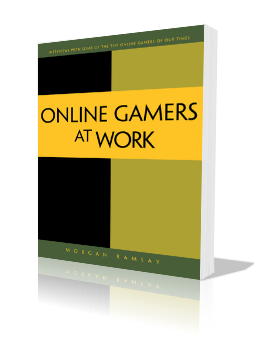 The 412-page book of 15 interviews takes readers behind the curtains of industry titans, like BioWare, CCP Games, and King, to reveal the strategies, sacrifices, and long hours that lead to success in online, social, mobile, tablet, and serious games. Through every story, Online Game Pioneers at Work ultimately provides a unique look at leading, managing, and growing small businesses into great businesses. This entry was posted in 2, Developer, game, games, Games Developer, mobile, train, train 2 game, Train2Game, www.train2game-news.co.uk and tagged 2, game, Games Developer, games industry, Judy Greer, Kongregate, Online Game Pioneers at Work, train, Train2Game, Video Games by Train2Game Blogger Team. Bookmark the permalink.